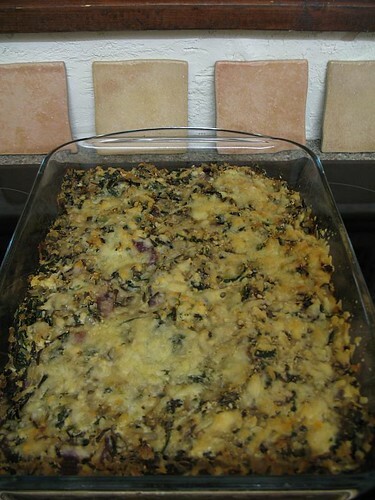 101 cookbooks posted this mushroom casserole recipe a few weeks ago and i decided to try it the other night. i made enough changes that i'm not sure if it's fair to consider it the same dish. call it 'inspired by' instead. i added aubergine and courgette (eggplant and zucchini), as well as some fresh spinach. i used tofu instead of cottage cheese, and greek yogurt instead of sour cream. it tasted great - and was probably the healthiest meal i have ever made - but it wasn't very creamy. i think i might try making risotto next time instead, but keep the fresh vegetables. the mushrooms made me especially happy. in the back of the photo, you can see our tiles. you might notice that they aren't attached to the wall yet. the tiler was supposed to come yesterday but had car trouble. we're hoping he comes as scheduled next thursday!